The Internet, or parts of it, claims the HPV vaccine is ineffective or less effective for African American women than for white women. This idea appears to have originated with Bustle and their take on a study that looked at HPV types in women undergoing testing of pre-cancers of the cervix. Drawing conclusions about the vaccine, cancer, and African American women from that study is wrong. Here’s why. The biology is a little complex, but it’s really important so stay with me. There are 3 stages of pre-cancer of the cervix: 1, 2, and 3. They are called CIN or cervical intraepithelial neoplasia. CIN 1 is the mildest, CIN 2 is in the middle, and CIN 3 is the most severe. As 2 and 3 can be very hard to tell apart they are typically lumped together as severe dysplasia and CIN 1 is called mild dysplasia. All cervical cancers were at one time severe dysplasia, but not all severe dysplasia becomes cancer. Mild dysplasia rarely becomes cancer. What did that study quoted by Bustle say? Vidal et. al. evaluated swabs from women with pre-cancer of the cervix undergoing colposcopy (an examination of the cervix). The authors reported finding less HPV 16 and 18 in African American women with pre-cancerous lesions versus white women. Pre-cancers in African American women were more likely to be positive for HPV 31, 35, 45, 56, 58, 66, and 68. As pre-cancers are the necessary step before cancer and the two vaccines on the market at the time only protected against HPV 16/18 could this mean African American women were being left unprotected? Before we go further there are two important points to address. The first, looking at the HPV types in pre-cancer is not the same as looking at the types in cancer as not all pre-cancer becomes cancer. The other is that evaluating swabs as opposed to a piece of tissue (a biopsy) is less accurate for cause and effect. The gold standard is biopsy. HPV 16 and 18 are the worse type of HPV. For everyone, regardless of race. A CDC non pharma funded study just published (April, 2015) looked at the biopsy specimens of women with cervical cancer. Specimens were analyzed for HPV. What the investigators found is HPV 16 and 18 was identified in the majority of cervical cancers (about two-thirds) regardless of race. So whether you are white, African American, or Hispanic the older HPV vaccines (Gardasil and Cervarix) would be just as effective at preventing cervical cancer because they protect against infection with HPV 16 and 18. The differences in the numbers above were not statistically significant. All testing methods are not the same. The Vidal paper wasn’t designed to determine which type of HPV lesion caused the pre-cancers because they used the cells collected during a Pap smear and not the actual tissue. However, other papers have looked at the HPV types in biopsy specimens of pre-cancer of the cervix. Two studies (one of which is the study I quoted above) have shown a lower incidence of HPV 16/18 in biopsy specimens of pre-cancers from African American women compared with white women, but another one hasn’t. It’s hard to know what this means given every study shows that HPV 16 and 18 are the worst when it comes to cancer regardless of race. African American women do have different HPV types in pre-cancerous lesions of the cervix versus white women, however, ultimately the ones that progress to cancer (meaning the ones that truly matter) are the same. 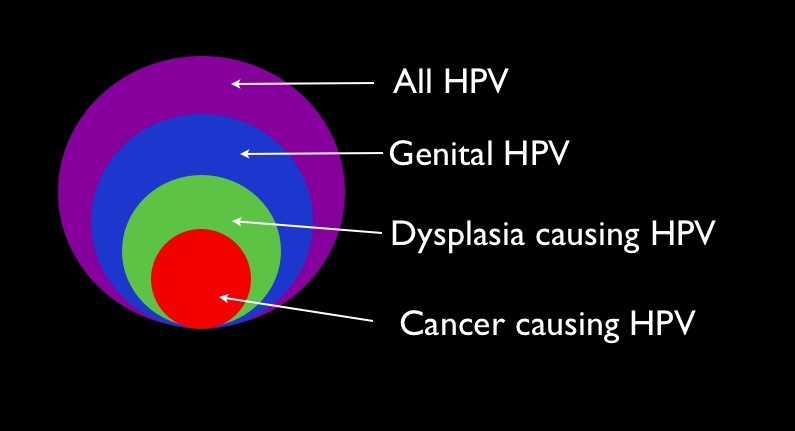 Looking at the image below imagine the HPV types that make-up of the part of the green circle not covered by the red smaller circle are different for African American women than white. The red circle (the one the vaccine aims to prevent) is the same. While at ACOG (American Congress of OB/GYN) this week I had the opportunity to ask two experts, Dr. Kevin Ault who is an HPV vaccine researcher, and ab epidemiologist from the CDC about this very issue. Both of them said the same thing – that the make-up of dysplasia that isn’t destined to be cancer may be different between races but what matters is the cancer. Based on all the data available woman are protected equally from cervical cancer by the HPV vaccines regardless of race and the new 9 valent vaccine will offer the greatest level of protection. « The importance of the HPV vaccine in one graphic. Really.